Line Drawers. It’s an age-old question: To line, or not to line? Some people argue that there are cleanliness benefits, while others will say that it’s more for aesthetics. Regardless of which side of the drawer-liner argument you’re on, we can all agree that maps are a beautiful way to fill your drawers. Simply find a large map that will fit a drawer or overlay multiple maps. Use clear, double-sided tape to attach your paper to the bottom (and sides, if you want) of your drawer and you’ve got Grandmother-approved lined drawers. Frame Photos. Maybe you were married in Maui or your niece was born in Manhattan. Either way, there’s probably more than one photo to commemorate the special occasion. 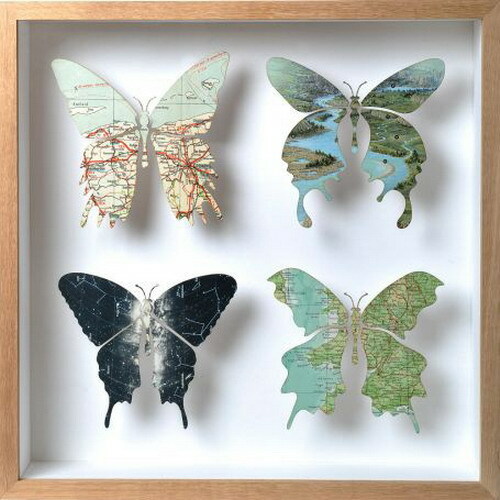 Highlight the moment forever by framing a photo in a corresponding map. You’ll need: A map, Mod Podge, a paint brush and a basic flat frame. Maybe Matilda does a great job with her step-by-step! Note: Pay attention, and don’t paste your maps upside down, unless you don’t mind those street names being illegible! Relive Cities. Your childhood hometown. Your favorite beach destination. Your college town. Certain places hold significance in your life, and maps of those cities, states and countries can add a personalized touch to your home. It’s easy and inexpensive to turn an old map into a heart-shaped décor piece. Simply pick a few of your favorite maps (or just one), and cut them into heart shapes. Using straight pins or glue, attach your hearts to a canvas or place them in a shadowbox. Then, enjoy your new art! Make Magnets. If you have little ones around the house, or if you just like the look of the lower 48, it’s easy to turn an old US map into magnets. Your kids will learn a little bit about geography every time they open the fridge, and you just might be surprised at the knowledge you pick up, too. Here’s a fun one - what states border Idaho? If you don’t live in the gem state, you might need a refresher! For map-making instructions and pictures, check out Natalme.